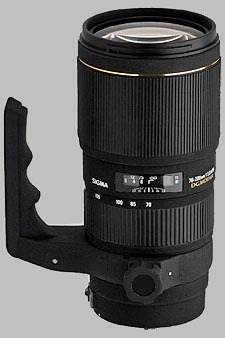 (From Sigma lens literature) Sigma APO 70-200mm f/2.8 EX DG Macro HSM is a large aperture zoom lens designed specially for digital SLR cameras with close-up capability. This large aperture telephoto zoom lens has a minimum focusing distance of 100cm (39.4") throughout the entire zoom range. It is very convenient for close-up photography. This lens uses two ELD (Extraordinary Low Dispersion) glasses and two SLD (Special Low Dispersion) glasses for utmost correction against chromatic aberrations. This lens' super multi layer lens coating reduce flare and ghost, which is a common problem with digital cameras. I purchased this lens as my telezoom for sport shooting (in general quads) for (in recount) about $900. When the nice red and black box came to me, I was very happy. When you open it, a proper black pouch shows up. Certainly, in it you'll find a lense (and a strap to the pouch). My first sensation was like "wow, what a great piece of lens!". It is really well built, and in its casing youll find a millions of little shiny things. I just love the effect! AF works perfectly accurate and it's almost silent. It doesn't hunt in low light or so. Of course you can override it whenever you want. Oh, and one more thing, I lost the front cap on the second race, it had to pop out when I was taking it off from my backpack. Shame that Sigma have't improved that thing. Very well built and professional feel/look. Much too soft at max aperture and range. I recently received this lens from an on-line vendor for my Nikon DSLR. I was pretty excited opening the package and immediately noticed how well the lens was built. This thing is built like a tank! Very professional and nice looking. The lens motor was very quiet and fast. I tested this lens over a period of two days at various distances and lighting conditions. Unfortunately at (200mm @ f2.8), the range I planned to use this lens the most I found was extremely soft. In this range was also a glowing effect around contrasting areas. Zooming down to 135 or less significantly increased the sharpness. Also bumping the f-stop to 4.5 or a little above increased the sharpness significantly, but the glow near the contrasting areas was not as easily eliminated. To be fair, I don't know if this particular lens is faulty or if all the Sigma lenses are this poor. I plan to return this lens for a refund and hope that I'm not as disappointed with a new Nikon lens. I was interested in two lenses and I first went to a store to compare the Nikon 70-200 F2.8 AF-S VR and the Sigma 70-200 F2.8 APO Macro. While I preferred the Nikon lens for the vibration reduction system and its handling, I had to go for the Sigma lens for its price tag (almost half the price of the Nikon’s) and the Macro capability. The lens came with a tripod collar, a petal type lens hood and a great case. I now have had the lens for about 2 months on a Nikon D70s and I am very pleased! The lens looks and feels solid and nicely built. It is well balanced even though the amount of glass to have F2.8 means it is heavy. A hand below the lens is required to assure the right balance with the camera and to avoid shaking. I find the tripod collar very useful. When the lens is not attached to a tripod the collar can be rotated upside down to allow a better hand grip to support the lens. The tripod collar can be mounted and removed very quickly and easily if needed. For those concerned by the weight, this will remove around 140g (about 10% of the weight of the lens). Once mounted on a tripod, this ensures the proper balance of the lens and the camera. I love the possibility of rotating the lens using the collar on the tripod to change quickly from landscape to portrait layout. I don’t have a very sturdy tripod and I am always worried about losing the balance of my camera when I tilt the camera at 90 degrees using the tripod head. Here, I no longer worry when I use the collar as everything stays stable. The autofocus is fast and silent. The focus is difficult in low light condition but I think this is common to most lenses. The autofocus is usually accurate but I found, as mentioned by other reviewers on the previous model (without the macro capability), that it is sometimes necessary to do a manual correction. Since the autofocus is fast and the correction is a matter of a fraction of a second, it does not bother me too much. Indeed, after some practice, I learned that I need to turn the focusing ring manually one degree or so to the right and the photo will be fine. I wondered for a short time if I should send the lens back to Sigma but I decided that it is more important for me to know my lens better and adjust to it rather than blaming the lens. At the same time I think that the slightly off focusing problem could be due to the use of the dynamic area mode to select the focus area on my D70s. I still need to experiment with other modes for selecting the focus area on my camera and see if there is any change. Finally, the lens is a telephoto and as such magnifies the subject in a way that a subtle variation in focusing can make a big difference. Since I cannot make a direct comparison with another lens, I believe I will continue to rely on the autofocus and do a manual correction when needed. Overall, the pictures are sharp with a lot of details and the bokeh is very nice. The pictures are a little soft at the 200mm end and I prefer using F4 instead of F2.8 to keep the pictures sharper. The minimum focus distance of 1m makes this lens the best in its category for macro capability though it is not a true life-size. The results are really good and it is very convenient to be able to get that close. I have recently acquired the Sigma APO teleconverter 1.4 x DG EX (thanks to the money I saved when I bought the Sigma lens instead of the Nikon lens!) which converts the lens to a 98-280 F4. This corresponds to a 150-420 mm lens on my Nikon D70s (1.5 x focal length multiplier) and the lens keeps the same minimum focusing distance of 1m. The 1.4x teleconverter is easy to mount and small enough that it does not really change the balance of the lens or its weight (adds about 150g). I had the chance to try the 2x teleconverter in a store and did not like the substantial addition of weight and the change in balancing. It also seemed to me that the 2x brought a lot of softness to the pictures. I have not used the 1.4x teleconverter long enough to have a definitive opinion but so far I have really enjoyed it. Again, it is better to avoid the new 280mm end to have sharper pictures. I am waiting for nicer and sunnier days to explore more the capabilities of the lens and the teleconverter. I hope this is going to come soon as I find my first winter in the south of England already too long! In summary, at around half the price of its competitors Canon and Nikon, the Sigma lens behaves very well. It would be perfect with an image stabilizer like the Canon and Nikon models but this would also make it more expensive. The Sigma lens is really a winner in terms of built and picture quality. There are some limits (such as the softness at the 200mm end and sometimes the need to manually correct the focus) but once these problems are taken care of, the lens delivers great photos. Finally, to be able to get as close as 1 meter to take close-up pictures is a great advantage over the Canon and Nikon lenses. I traded my original 70-200 in due to problems with my D70. I bought a D80, and decided to give the new 70-200 a try. Boy am I glad I did. Sharpness: This lens is sharp, as sharp as my Nikon 50 1.8 and 85 1.8. Bokeh: Creamy smooth out of focus background with nice crisp edges. Build: Well built, nice pro look to the finish, the gold accents are a bit much for my taste but oh well. Great tripod collar to, nice petal hood. Focus ring is rubberized and has a nice tight feel. Zooms in and out like a dream. All internal too. Focus: fast fast fast, and accurate. What a lens! I am going to have a hard time taking this one off. It even doubles as a pretty good macro lens. RUN! DONT WALK...RUN out and buy one today.